Within the event of this testimonial, we have supervised a position of conducting, in negative harmonics, a passage between the afterworld of death and our ability to master control over its parts by maintaining formal contact with the sub-committee of horror. In this experiment, the bull is sedated. We have implanted an electrode into the brain of the bull and selected elements of the program will be examined through the neuropharmacology of the human brain at a later date. With this necropharmacology, we have agreed to keep the inquiry within bounds to satisfy the committee of death. Within the event of this testimonial, we have supervised a position of conducting, in negative harmonics, a passage between the afterworld of death and our ability to master control over its parts by maintaining formal contact with the sub-committee of horror. The testimonial has been given to the legion to the bats in the belfry and the tick-tocking of hearts primed to explode. We walk the night silently charged with a pulse towards the funeral pyres burning bright. We have a donned a second face. It is a skin, which we place over our biological face to broadcast our supernatural mastery in camaraderie with all that is ghoulish, fiendish, and frightening. Tonight we will make love until we die. 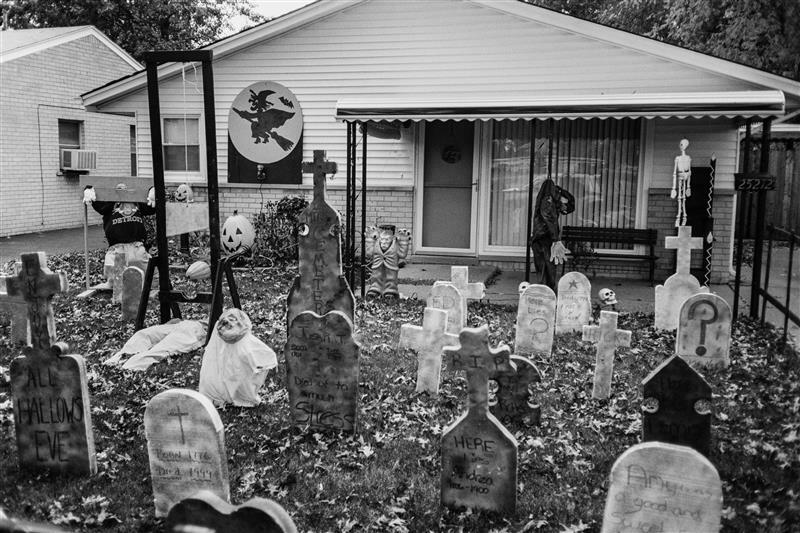 There is something so ingrained in the American psyche regarding the ghouls, tombs, and general presentation of collective horror every October 31st, that one could consider it to be a very specific American Gothicism. 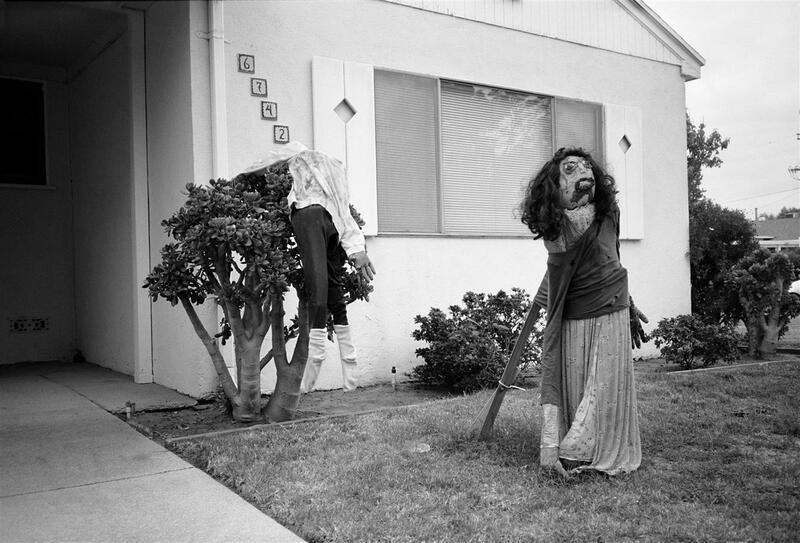 They sublimity of horror resounds as a very striking potential for our collective unburdening of fear. Cameron Jamie has made a long tradition of exploring nuances of ritual, horror, and tradition within his works. He has made totem images of Krampus figures, a tradition in Austria also exemplified by Charles Freger’s Wilder Man. The long history of Christian and pagan tradition within Europe and the inception of the sacred and profane was further institutionalized in American tradition in the early twentieth century. 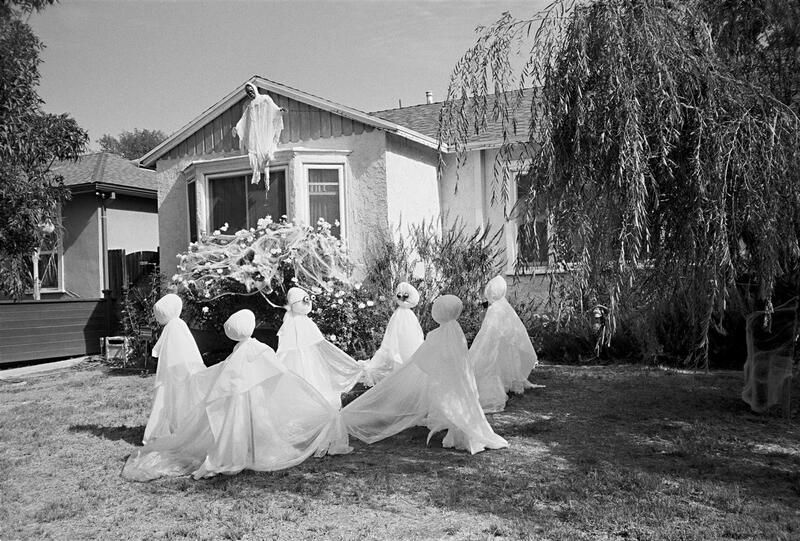 The liturgical date of October 31st, a passing reminder of harvest time and the preparation for dormancy and death funneled through a enhanced necromancy of sorts, the whispers of cathartic cackling and screams of the haunted house rousing a rapport with the bridge of the uncanny and that of death. 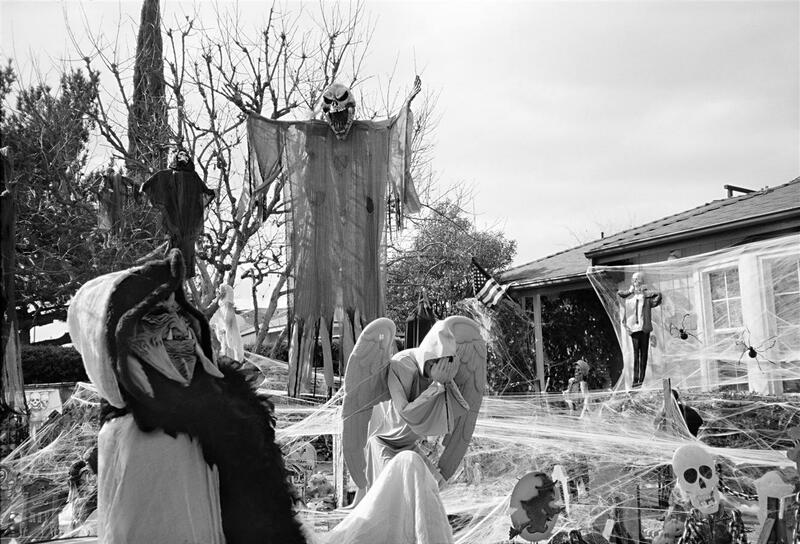 All hallows Eve is meant to confront the power of death by the living by presenting the community in solidarity with what they regard as fear. The employ of this fear is outward and consuming. 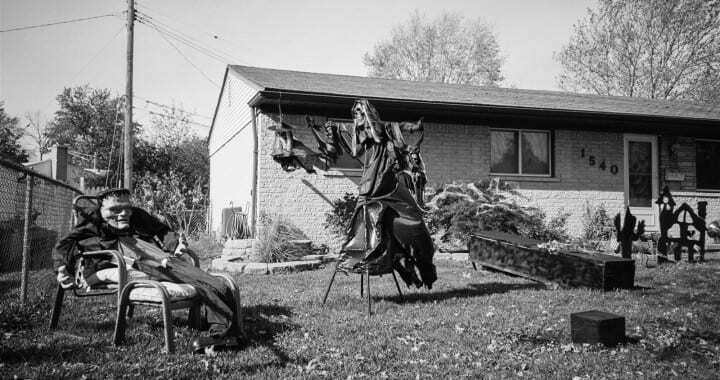 The liturgical date of October 31st, a passing reminder of harvest time and the preparation for dormancy and death funneled through a enhanced necromancy of sorts, the whispers of cathartic cackling and screams of the haunted house rousing a rapport with the bridge of the uncanny and that of death. Americans in their festive fervor spend large amounts of time in commune with this idea. 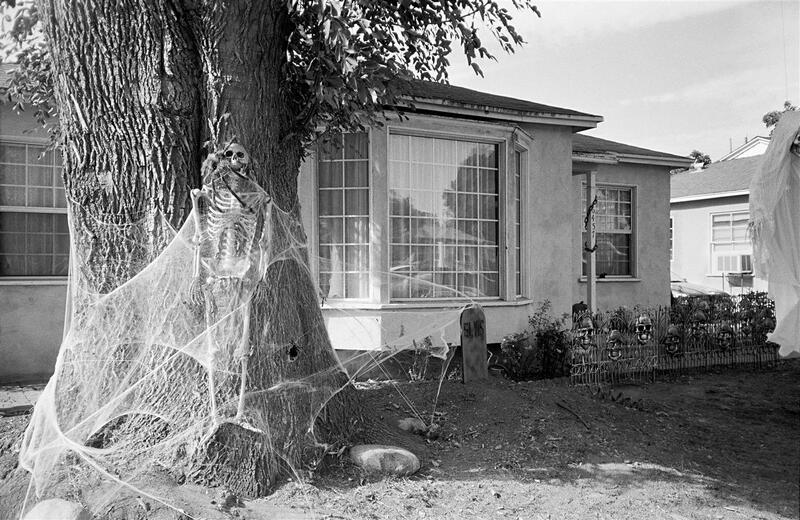 Front lawns and the eaves of porches are all adorned with skeletons, witches, pumpkins and coffins. 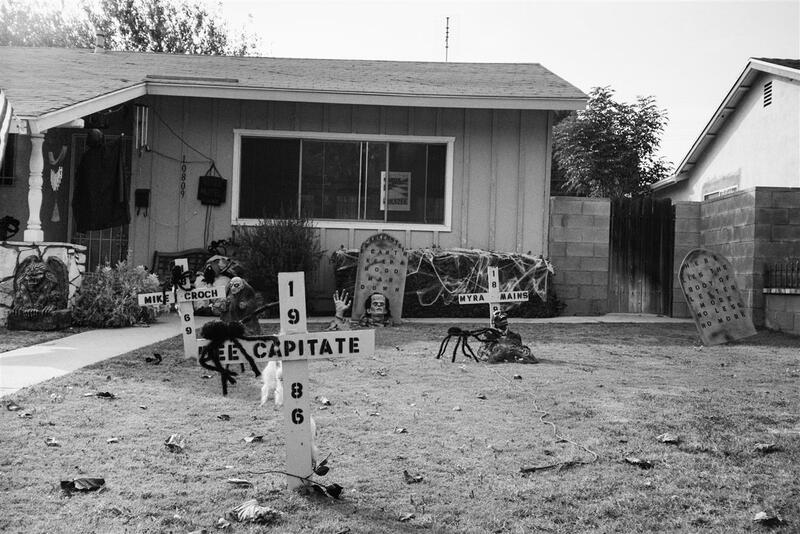 This is a ritualized custom that invites the spectator into the hinterland of death while also celebrating its position over that of life through festive engagement. Death as a catalyst for remembrance of life, a success in which only the holiday of Easter can perhaps imitate with much less aplomb. The book itself is an exceptionally produced, as is everything on Edition Patrick Frey, complete with glow in the dark cover and gravestone-imitated endpapers. It is a rightful production for such a project, the monochrome images inside becoming pathologically reduced from the myopia of nostalgic affect that color sometimes disables. 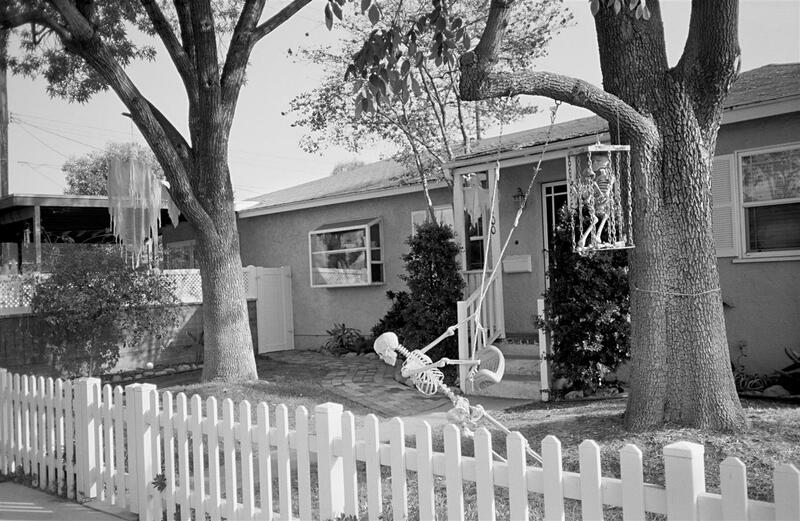 If the images had been made in color, one may suspect that the uniformity of idea may have lacked the specific nostalgia for horror that black and white can often produce. It also stresses past the easily attainable status of kitsch by reminding one of the ritual of the event. Posted in Featured, Reviews and tagged alhallowseve, Archive Highlights, Book Review, bradfeuerhelm, Cameronjamie, Death, editionpatrickfrey, frontlawnfuneralsandcemeteries, Halloween, horror, horrorbusiness, misfits, necropharmacology, samhain.